The Sand Creek Massacre in late November 1864 sparked one of the most tumultuous periods of Indian warfare the Plains region would see. 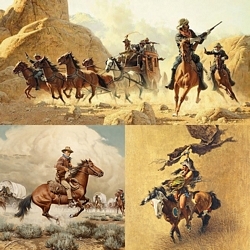 From Montana to the Santa Fe Trail, the Cheyenne, Arapaho and Sioux, eager for revenge, raided and plundered ranches, wagon trains and outposts. Here, an avenging band of warriors has surprised a train at a vulnerable point along its route ― just as it is about to stop for much needed water. No other artist’s style seethes with the high sense of drama as much as Frank McCarthy’s. Recognized as the “Dean of Action Painting,” it seems possible that McCarthy’s bold and colorful figures will boil out of the painting at any moment. This Anniversary Edition Canvas is the perfect example of McCarthy’s style: action, action and more action with a touch of spectacle thrown in for good measure.